This November and December, there are several fun ways for you to help Make-A-Wish Southern Florida. Whether you want a formal, elegant tea party, or to see a massive-holiday light display, you can help grant wishes to children all over Southern Florida who are facing a critical illness. By attending events like these, you help to provide wishes all across Florida; in cities like Hollywood, Hialeah and Fort Lauderdale. As Part of a Kids For Wish Kids project, Nicholas Caine sets up a massive holiday light display at his residence in North Miami Beach (1880 NE 181st St.). Nicholas’s event includes fun activities such as inflatable rides, a DJ, food stands and photo opportunities with Santa. More than 1 million lights and 100 inflatables will be on display to help brighten the holiday season from Nov. 1, 2015 to Jan. 4, 2016. There is no cost for spectators, and 100 percent of proceeds from concession sales and photos with Santa will benefit Make-A-Wish Southern Florida. If you have questions, please e-mail nicksstarlightspectacular@gmail.com. The Palm Beach Sailfish Classic is a 3-day tournament that will take place on Nov. 19-21, at the Palm Beach Sailing Club (4600 N. Flagler Dr., West Palm Beach). Kickoff will be at the Palm Beach Shores Community Center on Nov. 19 and the awards banquet will be at the Plaza Ballroom on Nov. 21. Half of the net proceeds will benefit Make-A-Wish Southern Florida. In the tournament’s 9-year history, Make-A-Wish Southern Florida has received more than $220,000 from the proceeds of the tournament. Cash pots are available for captains, anglers, tournament winners and more. For more information, contact Pat Ross at (561) 818-6095 or fishgalblue@aol.com, or visit www.pbsailfish.com. 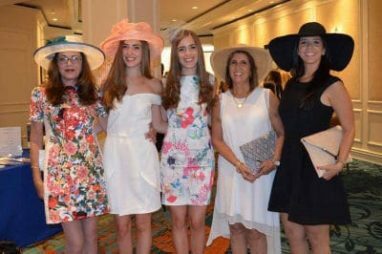 Join fellow Make-A-Wish volunteers and donors at the elegant and upscale Tea At The Ritz on Dec. 6 in Naples. This fine dining experience will take place from 2-4 p.m. Saturday afternoon at the Ritz Carlton (280 Vanderbilt Beach Road). Guests will receive royal classic tea service along with champagne, tea sandwiches and fruit tartlets. Tickets are $125 and all of the proceeds from the event benefit Make-A-Wish Southern Florida. Tickets are sure to sell fast, so RSVP today by contacting Lesley Colantonio at 877-709-9474 ext. 22 or by email at lcolantonio@sflawish.org. Deadline to purchase tickets is Dec. 4. Holidays can mean a more busy and hectic schedule for many families. If you’d still like to make a donation to Make-A-Wish Southern Florida, we have a solution for you. Donate your used car to Wheels For Wishes and benefit your local Make-A-Wish. Don’t waste your valuable time trying to find a new home for your vehicle – donate today! Car, truck, boat, RV, SUV or motorcycle, Wheels For Wishes will tow away or pick-up your vehicle at no cost to you. Since we are a 501(c)(3) nonprofit organization your donation is tax deductible, and you can be sure your donation is making a difference. Make your donation by 11:59 Dec. 31, and it will even count toward your 2015 taxes. Now is the perfect time to donate your car for charity. Call 1-877-431-9474 today, or make your donation online by filling out our easy online donation form. If you are unsure about the donation process, our experienced representatives will walk you through the process and answer any questions you have.